Toyota was voted as the Most Trusted Brand™ of hybrid car and passenger car manufacturers in the annual Trusted Brand™ study conducted by Reader’s Digest. Nearly 20,000 more Canadians switched to hybrid vehicles in 2016, and during a record hybrid sales year in Canada, Toyota was chosen as the Most Trusted Brand™ of hybrid car manufacturer for the seventh straight year. 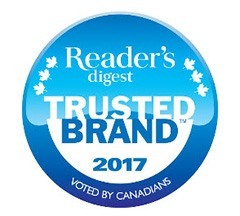 Canadians have also voted Toyota as the Most Trusted Brand™ for passenger car manufacturer for the ninth consecutive year – which is every year Readers Digest has undertaken the study. Reader’s Digest commissioned Ipsos Canada to conduct a nationwide online survey of more than 4,000 Canadians to identify the brands they trust most. In an open-ended question format, respondents were asked for their most trusted brand within each of 30 product categories, from packaged goods to financial institutions. By being chosen as a Most Trusted Brand™ for five or more consecutive years, Toyota continues to earn the designation of GOLD winner status from Readers Digest.